Explore inspiration boards, etiquette, planning tips & more! See the colors. Feel the quality. Experience the difference firsthand. Choose any colors you want for your design. You're in control! High-quality stationery, printing, and support at every step along the way. Shop contemporary Rectangle Invites featuring typography and other hot trends in stationery. Through classic and elegant design elements, these invites honor the beauty of tradition. Whether you’re off to Waikiki or Wine Country, shop designs to fit your unique locale. 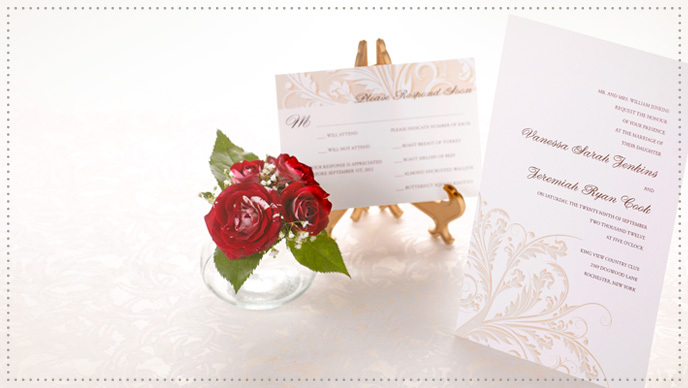 Widely popular, Rectangle Invitations are beloved for their timeless beauty and incredible versatility. Their contoured, flat design makes it easy for guests to save your invitation on their fridge or in their planner. Simple and sleek, Rectangle Invites still reserve ample space on both sides to share your wedding date, location, and other essential details. For organized style, slip your Rectangle Invite ensemble into a coordinating, custom-fitted Half Moon Holder. To add stylish suspense, drape a soft sheet of Vellum on top of your invite. Entice guests to open by wrapping the outside with a Vellum Band and Seal. Personalize with your colors, monogram, or message! Embellishments, RSVPs and Enclosure Cards sold separately. Make Any Design Truly Yours.